Here is our new Ariana Grande Star Wallpapers and New Tab extension with beautiful high quality Ariana Grande themes. Each time you open a new tab page, it will look fabulous with our new Ariana Grande extension. Moreover, it includes many cool features to improve your experience while using this extension. Ariana Grande is popular singer, actress, and songwriter from Florida, USA. Her career began in 2008 when she appeared in many theater and television programs such as Nickelodeon television series Victorious and the spinoff Sam & Cat. Moreover, she lent her voice to animated television and films. The soundtrack Music from Victorious represents the beginning of her music career in 2011. Yours Truly is her first studio album, released in 2013. It managed to enter the top of the US Billboard 200. Many critics compare her vocal range to Mariah Carey. Today, Ariana Grande has 4 albums and 4 tours behind her which all reached the top at many charts and lists. Furthermore, we expect her 5th studio album in 2019, Thank U, Next. Also, her videos had been viewed more than nine billion times. Moreover, she owns many awards and nominations, such as three American Music Awards, three MTV Europe Music Awards, four Grammy Award nominations, and more. Furthermore, in their list, The Time named her as one of the most influential people in the whole world. -Ariana has italian roots. She is half Sicilian and half Abruzzese. -Coco, Cinnamon, Fawkes, Ophelia, Sirius, Strauss, and Toulouse are her seven dogs. Moreover, all of them are rescues. -Ariana has 4 octaves vocal range. Therefore, it explains why she can reach all of these high notes. -Before playing as Cat Valentine on Nickelodeon’s Victorious, her career debuted in Broadway, in a play called 13. We have added cool features to this Ariana Grande Star Wallpapers and New Tab extension, therefore, enriching your browsing experience and filling your day even more! With our Ariana Grande Wallpapers and New Tab extension besides many different HD wallpapers, you can also enjoy many features which we added to make your experience even better. Ariana Grande Wallpapers extension provides you with a local time option wherever you are. Moreover, it is accurate, so your weather will match with your current destination. 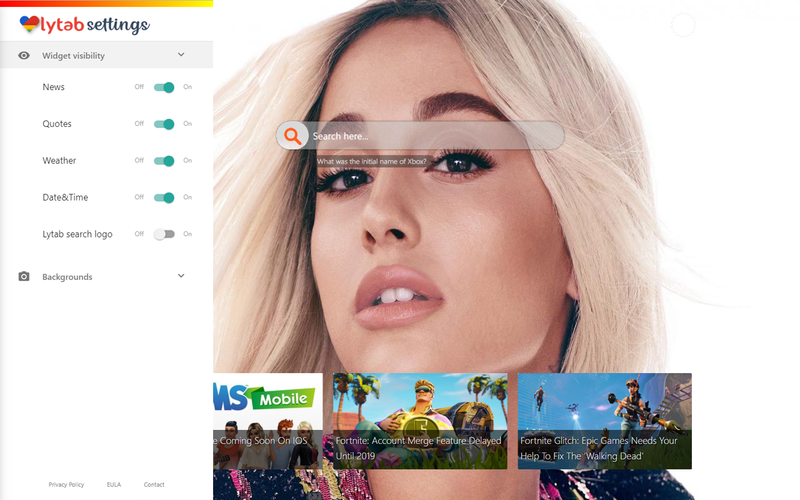 We present you the option to bookmark your favorite websites, stores or whatever with the bookmark option provided by Ariana Grande Pop Star Wallpapers extension. Therefore, you can also quickly access to recently seen websites with one click. Be inspired every day, because Ariana Grande Star Wallpapers and New Tab extension provides inspiring quotes and amazing facts every time you open a new tab. 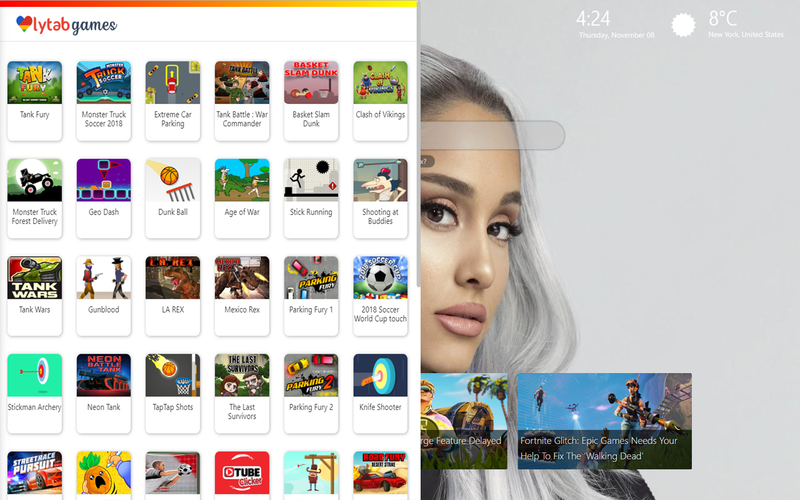 Ariana Grande Wallpapers and New Tab extension has many, many games you can play for free while you are browsing. This extension is pretty simple to install and you can always install it again. Install Ariana Grande Star Wallpapers and New Tab extension by clicking on Add to Chrome button and it will be automatically added. You can customize it according to your needs. This app is made for all Ariana Grande fans, and it is unofficial. The content in this app is not affiliated with, endorsed, sponsored, or specifically approved by any company. All copyright and trademarks are owned by their respective owners. The images in this application are collected from around the web, if we are in breach of copyright, please let us know and it will be removed as soon as possible. Minecraft Skins – What are Minecraft Skins? Unicorn Rainbow Wallpapers + How Did the Unicorn Meme Develop? !